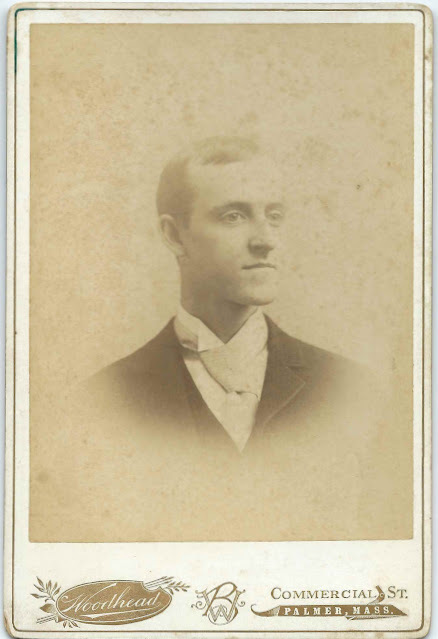 Cabinet photograph of a young man identified on the reverse as H. Binns of Lowell, Massachusetts - assuming I'm reading the surname correctly. 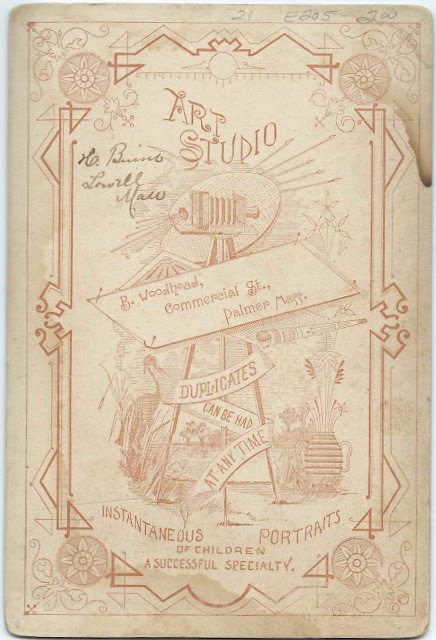 The photograph was taken by the Woodhead studio of Palmer, Massachusetts. A reader has left an interesting comment that Heaton's sister Bertha married the photographer Byram Woodhead in 1903. Since I found a Heaton Binns who once lived at Lowell, Massachusetts and later moved to Palmer, Massachusetts, I'm assuming the man in the photograph is Heaton Binns. Heaton Binns was born March 17, 1867 at Tariffville in the town of Simsbury, Connecticut, the son of Henry Binns and Lois (Dunford) Binns, who had immigrated to New England from England. Heaton graduated from Lowell Technical Institute at Lowell, Massachusetts, in 1899 and worked in the textile industry at Lowell, Massachusetts and in New York and Pennsylvania. On April 15, 1914 at Lowell, Massachusetts, Heaton married Gertrude Simms, daughter of Dr. William Cawley Simms and Juliana Smith (Hayward) Simms of Newfoundland. Gertrude was born at St. Johns, Newfoundland, on July 29, 1877. At the time of their marriage, Heaton was living at Amsterdam, New York, and working as the foreman in a carpet warehouse; Gertrude was a nurse, boarding at Lowell, Massachusetts. Gertrude's father had died in 1888, which presumably left the family in reduced circumstances. Gertrude may have been part of the wave of women from Atlantic Canada who moved to Massachusetts for work, as portrayed in the book Obligation and Opportunity: Single Maritime Women in Boston 1870-1930, written by Betsey Beattie and published by McGill-Queen's University Press in 2000. The link offers a free download. Heaton and Gertrude had, I believe, two children, a son and a daughter, born during the period when Heaton worked at a textile mill in Pennsylvania. It appears that Heaton spent the latter part of his career at a mill at Worcester, Massachusetts. He died at Palmer, Massachusetts, in 1945; Gertrude died at Waterbury, Connecticut, in 1965. Heaton's sister Bertha married Byram Woodhead (the photographer) in 1903. Wow, just the kind of information I was seeking - thanks!